Silvio Berlusconi became persona non grata for the Finnish people for saying that, after the United Kingdom, Finland was the place with the worst food in Europe. 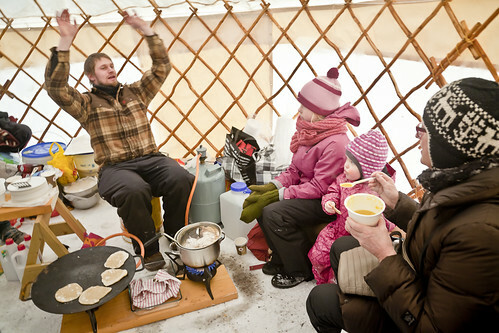 Finns showed their pride and their sisu  and wanted to prove that you can eat very well in this Nordic Country. In this spirit, the Finnish-born Restaurant Day was created. All the photos in this post belong to the Official Flickr account  of the Restaurant Day. A beginner of the Restaurant Day, waiting for clients. Source: Restaurant Day – Timo Santala. 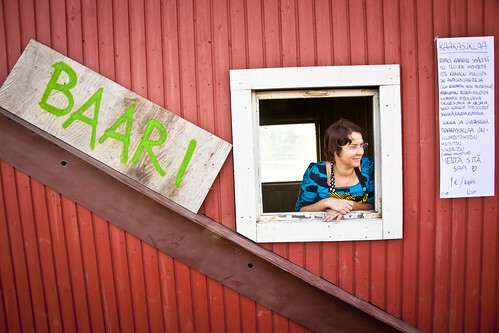 The Ravintolapäivä (Official Website ) as it is said in the Finnish Language , is a creation of Olli Sirén, in which anyone can – for a day – set up a food stand, a little café, or a bar. The place? Anywhere. House entrances, offices, a spot in a park, a rooftop… The type of food? Whatever you know best: it’s the choice of the eventual chef, which is you. The decoration or presentation? Can also be anything, whatever you want to bring to the table, and thus creativity can up your food sales. Initially the Restaurant Day was born in Helsinki, and the idea was to repeat the event every three months. In successive editions, the idea spread to other Finnish (and foreign) cities and it became international. A couple of years later it is already established as an international event, with cuisines ranging from Spanish to Indian. This family also decided to take part. In this case in the Winter Edition. Source: Restaurant Day – Timo Santala. Up to this point there have been 19 editions of the Restaurant Day. The first one was in May 2011, when 40 pop-up restaurants opened for that day. The second edition had that number multiplied by 5 and the number of cities was 30 in 4 different countries. The numbers of the third Restaurant Day were even more impressive: 300 restaurants and 40 locations. 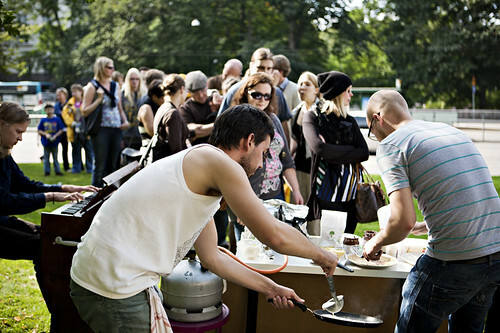 The Restaurant Day was the “Cultural Achievement Prize” of 2011, granted by Helsinki’s Office of Culture. There is no need to ask for a license to take part in the Restaurant Day. As one eater puts it , “it is food without bureaucracy, in the name of civil disobedience.” The only thing they can’t do, nonetheless, is to sell alcohol without a license. Something like that happened during our Erasmus in the house for student parties, “Skarpi”, in Joensuu: it was closed down after someone had the idea to buy beer at the supermarket and to sell it without a license during university parties (it should have been given away for free, of course). The next edition will be on the 21st of February 2016 (see participant cities ), and if you’d like to expand this event to your city or town – whether in Finland, Spain, the UK or Poland – you can sign up for it on this page . If you live in a city where the Restaurant Day has happened: Did you see it or take part in it? How was the mood and the food you tasted? If you did take part and send us some pics, we’ll be pleased to publish them on the blog.